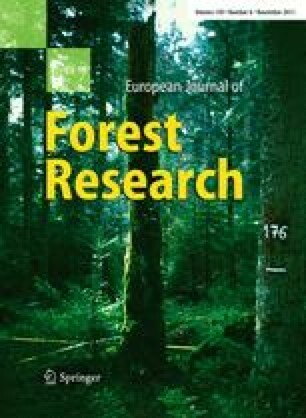 In this article, we present equations derived for the prediction of the aboveground tree volume and phytomass for twenty-five of the most important forest species growing in Italy. These equations result from ongoing research aiming to fill a gap in the models available at the national scale. With regard to volume, the results are particularly important for thirteen species or groups of species that were once scaled with models, conventionally assumed as reference models, available for other species. In Italy, phytomass models had never been constructed at the national level before. For any single tree, specific equations allow estimations of the following tree components to be made: stem and large branches (for either volume or phytomass), small branches (phytomass), stump (phytomass) and the whole tree phytomass. The models have been constructed on the basis of nearly 1,300 sampling units (sample trees). Although these equations must be considered intermediate results of the ongoing research because only half the scheduled number of samples has been collected, they have already been used in the practice, for example in the estimates reported in the recently published second national forest inventory. This study has been carried out within the Research Programme RISELV.ITALIA (Topic 4.1.6) financed by the Ministry of Agricultural, Food and Forestry Policies. The authors wish to thank Stefano Morelli, Michela Nocetti, Giuseppe Farruggia, Enzo Andriani and Sandro Zanotelli for the laboratory works and the data entry.